The target for entry into service is 2023-25. The widebody studies focused on an aircraft rather like the Airbus A330. Comac thinks airlines will need a replacement for that Airbus type next decade. That implies competition with the 787. In December 2013 National aeronautics group Avic described its development work on composite aircraft structures in preparation for the proposed Comac C929 widebody airliner. Technical challenges forced the abandonment of plans to build a composite center wingbox for its C919 narrowbody. Comac has chosen only foreign carbon fiber for the C919. Comac's the ARJ21 regional jet had only 1.5% composite content. The C929 is expected to reach 25% composite content. The wing will be composite, but there did not seem to be a plan to build a composite fuselage for the C929, development of which had not been launched. UAC’s view of the design was based on extensive research initiated by its Tupolev subsidiary under a project called ShFS (the Russian acronym for widebody airplane). This involved mating of an Airbus A300-style fuselage to the wing of a Tu-214. It had been conceived to carry up to 300 passengers on flights of up to 2,700 nm. 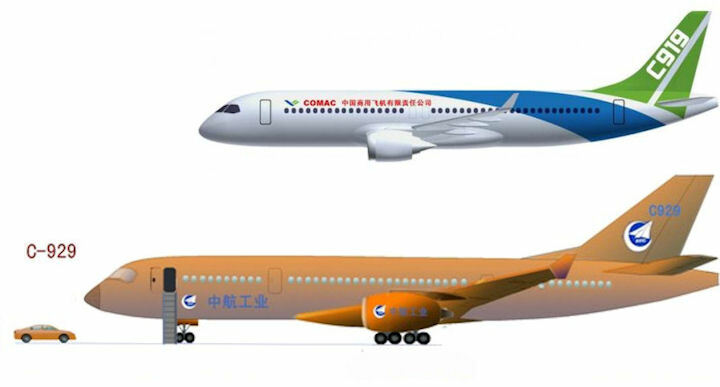 China and Russia will work together on plans to jointly develop a next-generation wide-body jetliner. The project is led by Russia’s United Aircraft Corp. (UAC), along with Chinese airframers Comac and Avic. The partners plan to develop a family of three models; a baseline version of the proposed twinjet would transport 250-280 passengers up to 6,476 nautical miles, followed by smaller and stretched versions of the same airframe. The early 2015 agreement called for the first flight to take place in 2021 followed by certification in 2024. An as-yet-unspecified turbofan for the airliner is expected to have thrust in the 77,000- to 88,000-pound range. The engine supplier is yet to be selected, but Russia’s Aviadvigatel is viewed as a likely candidate that could offer a more powerful version of the PD-14 turbofan now being developed for UAC’s Irkut narrowbody MC-21. According to Aviadvigatel general designer Alexander Inozemtsev, the PD-14’s core would be scaled up by 50 percent. The design house said in mid-2015 it can complete the documentation package in three years, beginning after PD-14 certification in 2017. The long-range, twin-aisle passenger aircraft CR929, which is being jointly developed by China and Russia, finished the preliminary demonstration work and determined the main parameters, such as the shape and sizes of the aircraft, earlier this year, according to its manufacturer. The wide-body aircraft entered its initial design phase, and related works haf been launched comprehensively, its maker, China-Russia Commercial Aircraft International Co Ltd, said during the November 2018 Airshow China in Zhuhai, South China's Guangdong province. The aircraft had grown during concept design, and its length was now virtually the same as that of the Airbus A330-900. But the body, sized for rows of nine economy seats instead of eight, was considerably wider.